I am drawing this title from an article that I read that I wish to share with you. However, I want to make a few comments before I share the article with you. One of the things that I find most interesting about how people talk about Africa is that they tend to think that Africa and its people are homogeneous. While they may share many similarities, they are not exactly homogeneous. In fact, there are many cultures and subcultures in Africa. First off Africa is a continent made of many countries. The African Union recognizes 54 countries. These countries vary in so many ways that it is virtually impossible to put them all together in one description. Many times people who take a cursory look at Africa tend to think they can apply what they learn about one region, country or community to the entire continent. This approach leads many people in a direction that is incompatible with the true essence of Africa, Africans and their way of life. The African continent contains communities that are very industrialized to communities that still live isolated from the world. There are innumerable languages and dialects. There are innumerable lifestyles, religious practices and cultures. Africa as a continent is not a melting pot, but a place of differentiation and cultural mores. There are some things that are intrinsic to the African experience, that is, the importance of family and community, deep spirituality, an appreciation for nature and an honoring of the Ancestors. Depending on the region, climate and weather, there are festivals that acknowledge the harvest, the weather changes, and various other customs that signify the African's awareness of their environment and their connection to it. There are people who are nomadic and they tend to adapt to the environment or are nomadic because the environment is not sustainable enough to inhabit for long periods of time. Even the hunting styles vary from community, village, country to country. Again, Africa is not homogeneous, and while researchers and pundits may wish to identify Africa as one conglomerate of people, some often don't even realize that Africa is a continent and not a country, it is virtually impossible to place Africa and its people under one umbrella. One thing that is certain, everything that they do has purpose and meaning. Masks are made for specific purposes, certain words are used to describe certain things for a purpose. Relationships are purposeful and leadership is accountable. Before the advance of western civilization into the African experience, the elders were revered and the children belonged to the entire community, every adult male is a father and every adult female is a mother to all the children. Extended families and polygamy (polygny) is quite ordinary in most societies and there is also a smattering of polyandry where the women have more than one husband. The priests and priestess, elders and wise men and women have a high position in African society across the board, and are respected. Beyond that the customary way that these social norms are displayed vary from community to community, village to village and in some instance country to country, although, that is even stretching it a bit too far. When people begin to discuss and even study African culture, they are remiss to attribute a general broad brush to Africa, because it simply is impossible to do so. Over the past few years there have been several African leaders who wanted to Unite Africa under one umbrella, calling it the united States of Africa. Muamar Gaddaffi had that in mind as well, but, without understanding the extreme diversity of the many peoples who inhabit the African continent, what you typically get is an elite group of elite officials who decide what is best for "ALL" of the African people. History has shown even with institutions like the UN or the EU, that it is still very difficult to place a single umbrella over a very diverse group of people. 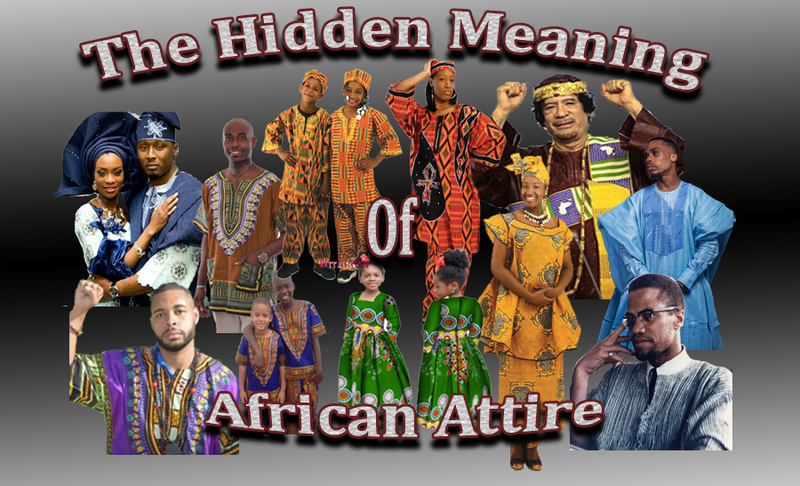 I would also like to mention that, in regard to this article, the focus is more on West African style of dress. 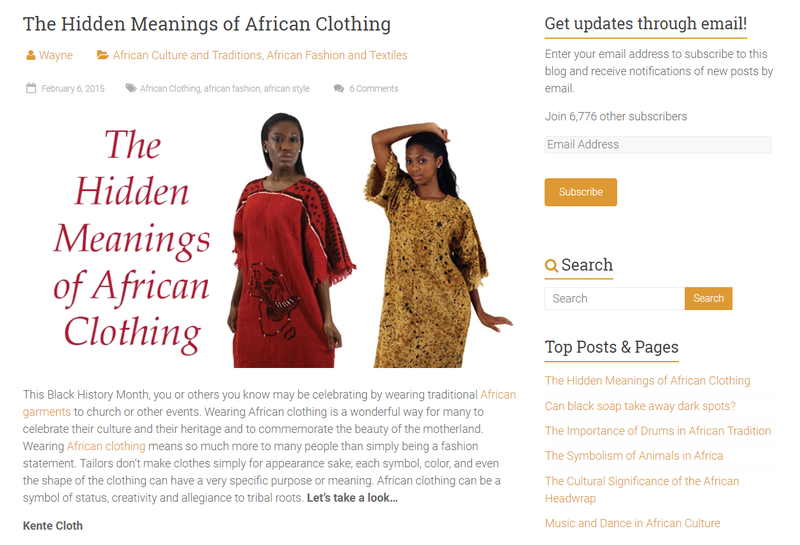 As you can see in my slideshow, that there are different styles of dress across the continent, and while West African style may be prominent or even more popular it does not represent the entire scope of African attire. It simply has become more popular in the eyes of the Western World who view it, with the same lens they tend to view most things, that is, they tend to pigeon hole and homogenize their perspective rather than take a look at the diversity. For some reason this diversity, makes it hard for them to understand what they are looking at so they make it easier for them to digest by painting the continent with a broad brush. The Africans in Diaspora throughout the world also represent a hodgepodge of diverse cultural practices, languages and lifestyles. Then when they migrate to other countries they tend to imbue some of the cultural norms of their new homes, while attempting to hold on to that which they have left behind. African people from all over the continent have been the brunt of ridicule and racism for at least the past 400 years. This was primarily done to justify slavery. But as I have stated before, if anyone wishes to build an empire they would not enlist the services of non-skilled labor to help them do so. So to think that the Africans that were brought out of Africa to build the "new land" were ignorant and unskilled is a misnomer that needs to be eradicated from the annals of history. Unfortunately, the Western society and its educational systems have done their level best to perpetrate the falsity that African people were ignorant savages, who knew nothing and had to be trained like animals. But, quite the contrary, they had to be divested of what they already knew and implanted with the spurious belief that African civilization, culture and mores were inferior to that of the European. Even in some of the commentary that I receive under some of my videos, it is plain and obvious that people are simply ignorant of the facts and the contributions that Africans and Africa have given to the world. But that is another video and I won't go into that right here. But, instead, I will acknowledge that their ignorance is not really their fault, if they were not taught any different, than how can they know any different? Therefore it's imperative for Black History, African History to be taught all year round as a significant part of the educational curriculum in the schools so that they can be informed of the true contributions that Africa and its people have given to the world. The invaders found artisans, craftsmen, iron workers, gold smelters, brick layers, masons, farmers, mathematicians, scientists, herbalists, educators, ministers, priests, astronomers, and even magicians when they came to Africa. The idea that the Africans they encountered there were ignorant and uneducated has altered the world view of the African over the past 4-500 years and has cause a great deal of ignorance to prevail around the subject of Africa and its people. Today, a certain curiosity has developed when it comes to understanding Africa and its people. However, as it becomes more and more mainstream, my concern is that even this curiosity will devolve into the same pattern of painting Africa and its people with a broad brush. To understand the African, you must immerse yourself in their culture, social mores and lifestyles. But, it has to be a specific attribution to a specific territory or region rather than using the "melting pot" scenario. It's a big bite and a long chew, but I would suggest a more localized study of a particular region and especially through their native tongue if you wish to understand them. Otherwise, you will make many mistakes and in some instances offend the indigenous African who knows full well his own culture and that what they do in Swaziland is not what they do in Nigeria! With that being said, let's go on to the article. 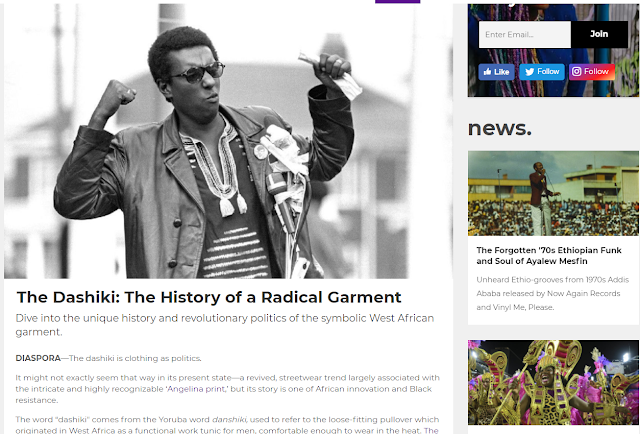 "The Dashiki: The History of a Radical Garment"
Here it is important to note that the term "dashiki" is a Yoruba word references to the garment worn by men. The garment that is worn by women is called a Buba. The man's garment is longer while the women's garment is shorter. Cultural appropriation of this garment can be scene across the African landscape and the diaspora in a variety of patterns and fabrics with the Angelina print reaching its hayday in the 1960's and having a resurgence in the late first decade of the 21 century. In fact, various African prints have been used to accentuate several fashion styles and modeling runways. The customary styles found most prominently in Nigeria and Ghana have become forerunners as their acceptance as traditional African garments are most popular. It was once noted to me from an indigenous African, that the garment and patterns themselves mean nothing compared to the individual who's wearing them. That is, at certain festivals one may notice that everyone is wearing the same or similar print garments. The individuals wearing these garments are empowered by their own essence and do not squabble about how another may be wearing the same print. The uniformity may have Westerners shying away from "looking like" or wearing something that is the same as another. Vying for their own uniqueness, they often miss that it is the wearer and not the garment that is unique. Also, the larger more flowing garment worn by men in Nigeria is called "Agbada" or if worn by women is called the "grand Buba" and the "Ntoma" or large wrapped garment is worn by both men and women in Ghana West Africa. The shorter version of Dashiki in Ghana has been referred to as "batakari" but Ghanaians will also call the men's top a Dashiki. Additionally, the wrap cloth worn by women is called a "lapa" by many Ghanaians or in their language "atade" or small cloth. Once you align yourself with the style it is also important to know the country from which it is herald. Africans among themselves are quite aware of the distinctions between cultures and styles. They can identify one another based on what they are wearing. However, within the confines of cultural appropriation and a bit of naiveté, a mixing of cultural styles of dress will be seen particular in popular modern fashions. Again we see a variety of head wear or coverings that bespeak a continent of diverse customs and styles. The customs vary and may demonstrate the various stations in life of the individual who is wearing them. For example, a married man or woman may wear their head covering in a certain way. This lets the community know that they are married. The same is true with those who are unmarried or single. The head wear symbolizes the complete look, in other words, you are not completely dressed until you have place a "crown" upon your head. Special occasions, festivals and the like will have the attendees wearing a variety of head wear from simple to extravagant. In fact, in Ghana, West Africa as well as in Nigeria, a single woman will not wear an over garment or "apron" while the married or elder women will do so. When indigenous Africans see their cultural garments worn by those who are not indigenous they make certain assumptions about the wearer. It is only natural that seeing someone wear your cultural garments in a manner that would be inappropriate within the cultural confines of your particular country, community or village would garner a certain aversion from the observer. In some cases, the observer may even attempt to explain the "appropriate" manner and occasion when such garments should or should not be worn, or simply, shake their heads at the ignorance of the wearer. Some may even go so far as to be offended. Recently there was a huge outcry about men wearing "skirts" or "dresses" as it was seen through the Western lens, that these garments were mainly worn by women. However, if you go back into human history, and take a look at the clothing styles worn by men, you will find that men have been wearing what appeared to be "skirts" or "dresses" for quite some time. The "pants" as a style strictly for men was introduced over the past few centuries while something wrapped around the waist of a man was more often seen. In Africa, the idea of using a pattern also was outside of the norm. Men and women sewed and were all considered tailors. In fact, it is quite common to see men sewing particular when it came to the patterns of embroidery that are seen accenting many African prints. It takes a very special skill to create these beautiful "free hand" patterns of embroidery. The advancement of Islamic or Arabic culture into the African continent has its impact as well in the style of dress and head wear for the men and the women. Interestingly enough, the particular style that is/was worn by the Islamists has much to do with climate and environment. Face coverings, in particular, have been worn by many desert dwellers who are covering their faces to guard against the hot sun and sand. Over time, this style became equated with "Islamic garb" when in fact it is more the garb of a desert dweller or nomadic person. Huge debates have been waged as to what is and what is not "Islamic" garb and how and who should wear what. But further study and research will bring to mind, that much of what is worn by a people is indigenous to their surroundings and environment and not necessarily due to their religion. Do not be confused by this. There are many people who are Islamic and are quite comfortable wearing Islamic garb in any environment. The Arabic style has become the Islamic style and many will find no difficulty donning these garments proudly and with great reverence. To them, it represents what they stand for and has a unifying effect on those who call themselves followers of the Islamic faith. Dive into the unique history and revolutionary politics of the symbolic West African garment. Working out how many members there are of the African Union is indeed quite easy. As set out on this list, it has 54 members. One of them – the Central African Republic – though still a member is suspended, or “under political sanction” following a coup. So is that the answer? Africa comprises 54 countries, all members of the AU. Well no, because not all Africa’s countries are in fact AU members. Traditionally, weaving is a men activity by both Ewe and Ashanti tribes. However, inauthentic versions of kente, often made of polyester, have flooded the Ghanaian market. The designs of original kente patterns are copied and mass-produced in Asian factories. These cheap copies have devalued authentic kente fabric and there is a risk that it might lose its special cultural significance. @Dr. Kinaya C. Sokoya, I totally agree with you. My emphasis on the connecting spiritually and intellectually is key, but also to travel there, learn at least one African language, study the customs of one Nation at a time, so as not to get too overwhelmed, etc. You are so correct, Africa and its culture and contributions to the world have been denied, maligned and withheld from us for far too long. We have to take the responsibility of making the connection, cause we certainly cannot depend on the educational system giving us one month, and barely a mention year round in the curriculum. Your summary is appreciated. Africa indeed is a continent with very diverse peoples. At the same time, you mentioned a number of common themes/values. That is also true. The study of and embracing our heritage is still very young. We as a people have to continue to reconnect with our heritage - a heritage that was denied, maligned, and withheld from us. Wearing/adorning traditional African attire is one way to reconnect. You said we should just try to connect spiritually or intellectually. Do we have to choose? Can we not do both? Another way to reconnect is to travel to Africa. It really enriches ones understanding. I recommend that all African Americans try to visit a country in Africa at least once in their lifetime.